Muskegon, Michigan. I was surprised, although I should not have been, that googling this structure yielded many articles *praising* this building. 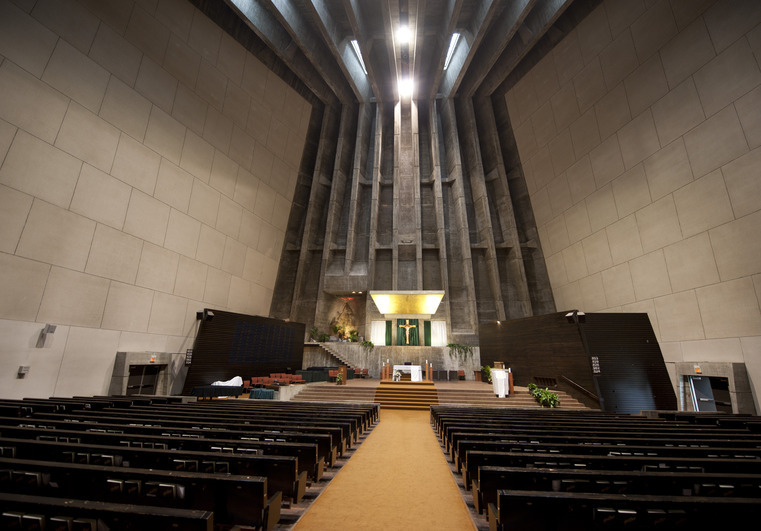 A fine example of Bauhaus, Modernism, Brutalism – you know, just what the typical Catholic in the pews wants in his church building. I’m sure there’s no connection. And a quotation from William Torrey Harris: “The great purpose of school can be realized better in dark, airless, ugly places…. It is to master the physical self, to transcend the beauty of nature. School should develop the power to withdraw from the external world. ” The purpose of school is, according to Harris, making obedient automata out of the students. So, what is the purpose here, in an environment so suited to Harris’s ideal? As for praise, no less an oracle than Concrete Construction Magazine assures us that this building “fully demonstrates the architectural potential of cast-in-place concrete construction.” Who could doubt it? So, any of youse guys got anything ‘better’ than this? Something to cheer you up – Our Lady of Guadalupe in Doylestown, PA. A more modern design but beautoful. I loved how it looked so much I stopped for a photo with it. Looks like there’s a red candle up there– tabernacle? Home Handyman magazine several years ago devoted an issue to concrete, and the editor’s introduction to it mentioned how the dome of the Pantheon in Rome was made of poured-in-place concrete, which was even gradually less dense toward the top center. Of course, we now know that ancient Roman concrete was harder and more durable than our modern standard, Portland cement. Maybe Concrete Construction Magazine should abandon modernist Germans and look to ancient Romans for architectural ideas.